There are many reasons why a tattoo that once seemed like a good idea, might become something you now would prefer not to live with. Most tattoos can largely be removed with pigment lasers. This removal can be delivered with minimal chance of complications such as scarring. Cosmetic tattoos, including eyeliner, lip liner and eyebrow tattoos. Don’t risk having your tattoos removed by non-medical people. Call today to for a consultation with our experienced clinicians. There are several lasers which are effective at removing tattoos. 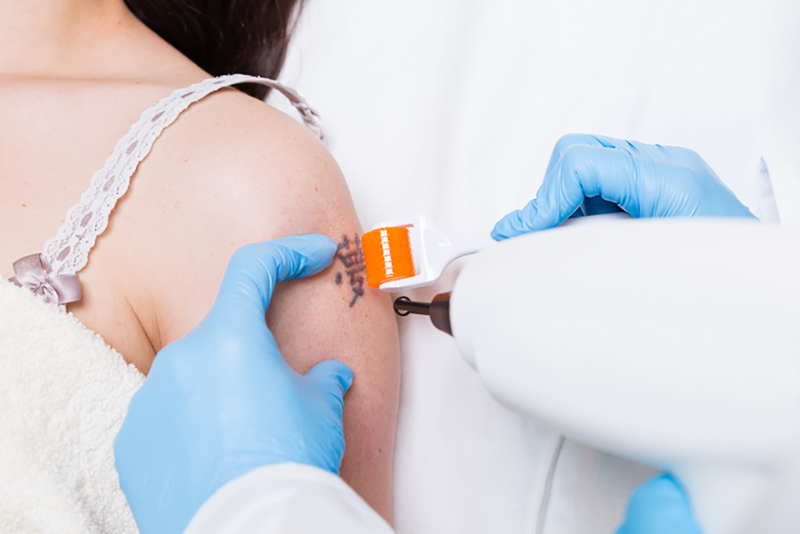 A consult with one of our specialist tattoo removal nurses, will determine which should be used for your tattoo. 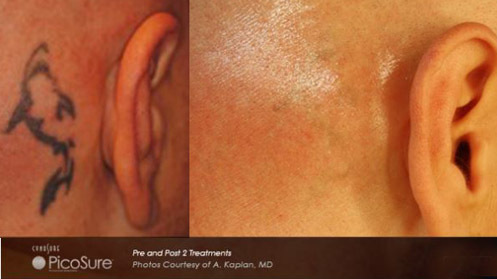 The newest tattoo removal technology involves the Picosecond laser by Picosure. This laser is a general all-rounder and has proved effective in treating most tattoos. 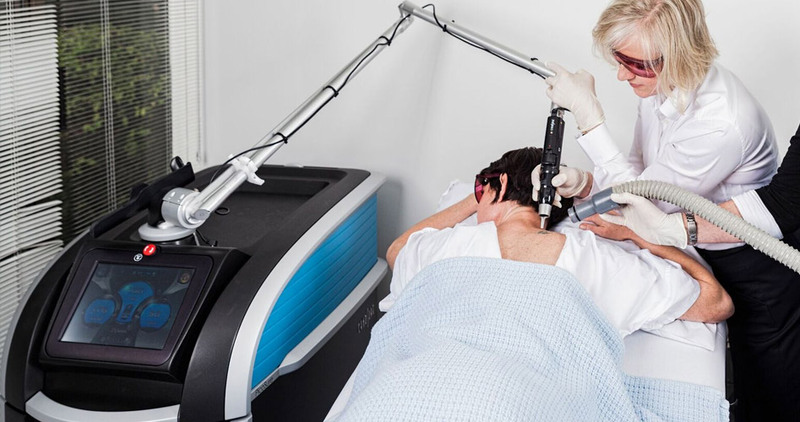 The Q-Switched Nd:YAG and Alexandrite lasers have been used in tattoo removal for some time and can be particularly effective in the removal of blue, black and red inks (YAG) and greens and aquas (Alexandrite). They are often effective where the generalised Picosecond laser has not succeeded. 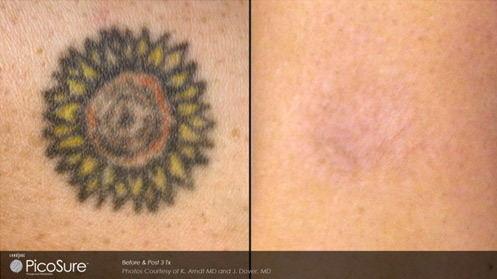 Laser tattoo removal works by using light energy to explode the pigments in the tattoo ink. These ink pigments are then absorbed into the body and eliminated through the body’s natural clearing processes. How long will it take for my tattoo to disappear? Many promises are made by those offering tattoo removal, which can give a false sense of speed and efficacy of treatment. It is our experience that different coloured tattoo inks take different amounts of lasering to fade. On top of this, as tattoo ink is not regulated, and tattoos can be obtained from any part of the world, it is difficult to know the composition and density of the tattoo ink. Some patients experience fading almost immediately, while the majority will see gradual fading, over a series of treatments. The cost of tattoo removal depends firstly, on the size of the tattoo. Obviously, small tattoos take less laser time and will, therefore, be cheaper. Secondly, the colours used in the tattoo. Some colour pigments are more resistant to fading than others. A patient’s skin type will determine the laser power level which can be safely used. If a lower power setting is required, the tattoo is likely to take longer to fade. For these reasons, we do not quote tattoo removal costs until we see the tattoo. We offer a free consultation with a tattoo removal specialist at our clinic, who will review your tattoo, skin type and any other relevant factors, and give you a quote for treatment. It is important to note that this will be an estimation of cost only. You will be quoted a per-session cost, with an estimated number of sessions. What’s involved in a tattoo removal session and how much will it hurt? When we use lasers on tattoos, the light from the laser explodes the colour pigment in the tattoo ink. This creates very tiny colour pigments which the body detects as a foreign body and removes via the immune system. While this process has proven safe till this point, it should be noted that because tattoo ink is unregulated throughout the world, there is no way of knowing exactly what your tattoo ink is made of, and as such, there is always the potential that dangerous metals and carcinogens may have been used in your tattoo ink and the removal process will release these into your body. The immune system should detect these and remove them, but we cannot guarantee this will happen. Depending on the level of pain management required and the size of the tattoo, treatment may take between 10-60 minutes. Longer treatment times are to allow time for pain killers to take effect. As with any laser treatment at our clinic, we have a range of pain management options available, which will be administered to suit an individual patient’s pain tolerance. It is our goal that treatments involve little or no pain. Can my cosmetic tattoo be removed? The removal of cosmetic tattoos including tattooed eyebrows, eyeliner, lip liner and other facial enhancements is commonly requested at our clinic and be removed by laser as effectively as regular tattoos. From acne treatment to cosmetic laser and laser facial resurfacing, we can help with any of your dermatological requirements. If you’re located in Mosman, Neutral Bay, North Sydney or anywhere else on the North Shore, we can provide specialised tattoo removal. Call Neutral Bay Laser & Dermatology Clinic and enquire on 02 9953 9522.